$20 to Participate and Take Something Home! 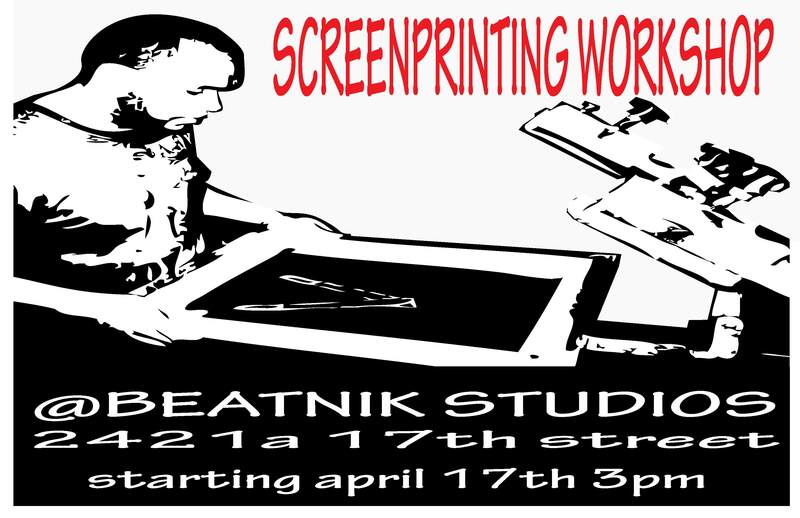 Sundays, May 15-29, 2011 – Come out to Beatnik Studios at 2421 17th St. from 3-5 pm and get taught a lesson in the techniques of screen printing. Learn why AycRock, who owns and operates SledgeHammer Graffix, has such a strong print arm. These creative, hands-on workshops are just $20 plus everyone gets to screen print and take their masterpiece home. There will also be t-shirts for sale from SledgeHammer Graffix and Chozn Wear. Go shopping now and purchase your favorite SHGraffix t-shirt at low merch-booth prices day of the workshop (you do not need to sign up for the workshop to just purchase). If you do, however want to sign up for the workshop early, e-mail us. We accept money orders, most major credit cards and, of course, cash in the palms of our hands. are you guys doing this again in 2012?